My wife is currently in Asia for a work trip. That means that I have all three kids, on my own. So daddy is pulling out the stops. We've been to the library. We've been to Lowe's (trust me, this is a wonderland for kids if you let them explore. Who knew that the toilet section was so much fun, even for a three year old?). We've been on bike rides and trips to the park. It has been wonderful and exhausting. In an attempt to keep the kids from missing mommy to the point of regular melt downs, I have come up with a couple of incentives (a.k.a. treats and bribes) that have helped keep routines as regular as usual. Here are two of the easiest treats that we have come up with, both of which have kept daddy's pseudo-sanity. Yeah, there is nothing terribly special about this, except we use both homemade cookies and homemade ice cream. We used chocolate chip cookies, baked and cooled. We then add one scoop of vanilla ice cream and a cookie on top. Return to the freezer until you're ready to use them. What are the benefits? I get to determine the amount and type of sugar in the ice cream and cookies. And have you seen store bought ice cream sandwiches? They're the size of a Volkswagen. Great size for me, but a little too big for my kids. I really don't need my three year old to consume that much sugar before bedtime. I determine the size of the cookies, and make ice cream sandwiches that are the appropriate size for my kids. And yes, I can pound down about four of them without batting an eye. Be careful with this one. It is life changing. Take some ripe bananas, peel them, cut them up into chunks, and freeze them. 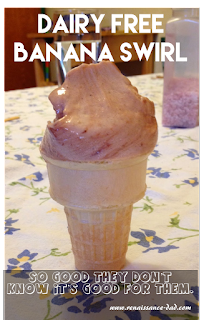 When you're ready to make the banana swirl, take the bananas out of the freezer and slightly thaw (microwave for 10 seconds, or if you're afraid that the using the microwave will cause hair to grow from the bottoms of your feet, just leave the bananas out for about 10 minutes). Put the bananas into a blender, add a splash of vanilla and a dash of cinnamon (seriously, I don't have measurements. Just put in the right amount), and blend. The consistency will be similar to soft serve. This is one of the creamiest desserts that I have ever had. 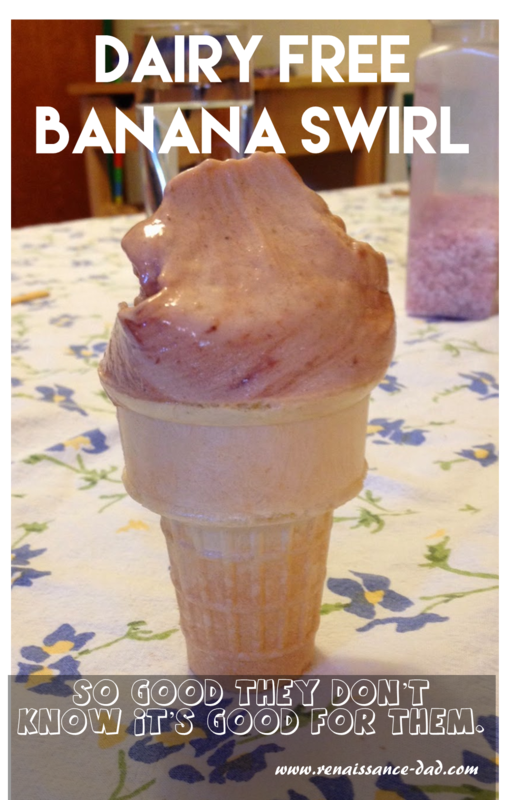 You can also add a little chocolate to the banana swirl. Serve in cones or dishes. My kids will eat two bananas worth of swirl each if I let them, and the silly kids think it's dessert. Enjoy! And if you happen to see smoke coming from the Chandler, Arizona area in the next five days, know that I probably had a project go awry while my wife was out of the country, and please call the fire department. Here's to a safe flight home! Hey, "the wife" here. Where is the love? Renaissance Dad failed to mention that WIFE made the cookie dough and froze it in small cookie-sized balls before I left on said trip...and I cut and froze the bananas, too. Behind every Renaissance Dad there is a (possibly mom-guilt driven) wife doing prep. Just sayin'. 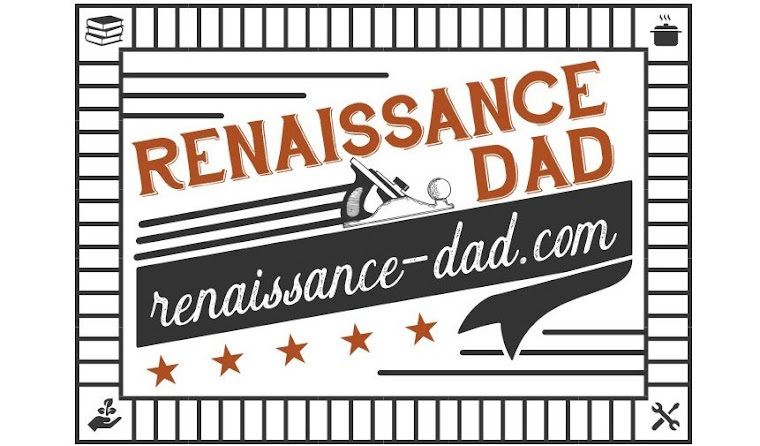 A Renaissance Dad is only as good as his Renaissance Wife. You should check out my latest article about homemade Dreamsicles (http://www.renaissance-dad.com/2014/06/homemade-dreamsicles-healthy-version-of.html). You get all the credit in that one! Thanks for being the wind beneath my wings!